In today's edition of Millennial Monday, I'm sharing my take on stats and stories on where we live. [contextly_auto_sidebar id="kvFgs570CZANxaM6VT6uMiRJveN8Pezb"]I've been thinking a lot about my living situation lately. I used to think that homeownership wouldn't be in my future, at least not in my near future. It's expensive as hell to own in Southern California, and for years I rationalized renting because it enabled me to live in neighborhoods where homeownership was financially out of reach (Hollywood Hills, Santa Barbara, San Diego). And then in December 2014, I had the kind of deus ex machina most people only see in movies. My dad died, just 18 months after my mom, leaving my childhood home in Toluca Lake (Los Angeles) vacant. Do I sell it and buy a condo, or do I move back to L.A., like, instantly? Amid colossal grief, I saw an opportunity. I sat on the decision for a month, and then orchestrated the move over an additional two-week span. It wouldn't be a cheap decision: the mortgage and living expenses would be a little more than what I'd been paying in San Diego. But I'd gain 1,000 square feet in living space plus a front yard, backyard and garage. What's more, I'd get to continue my parents' legacy and finish the remaining rooms they hadn't renovated. It just felt right, and so far it has been. Why the move out of cities? I think it's all about efficiency. For those of us living in big cities, it's borderline insulting to pay more in rent for an 800 square-foot apartment than you would for a three-bedroom house an hour out of the city. Plus, some of us want pets and yards, and are tired of paying extra rent for the privilege. Technology and the rise of remote work have also made it less important to live close to your place of work. I haven't worked in an office since 2007 (and that was a restaurant!). Although I'm a homeowner now, I identify with my peers who don't own homes. It's so expensive to buy, especially here in California. I used to feel disappointed that, despite a great income, I couldn't buy a home in the neighborhoods I wanted to. That I could buy, but I'd have to settle. Sometimes I feel guilty about how lucky I've been. That didn't sound right. Let me clarify. Losing both of my parents in such a short period was horrific. It still is. I'd give all this back to have them here. I've accepted the fact that my parents are gone, and am always looking for the positives in what has otherwise been a dismal situation. With this perspective, I lucked out. I walked into a mortgage and just had to make the payments. I'm benefiting from property tax rates from my parents' purchase date in the 70s. I'm in a beautiful home that I couldn't afford otherwise, and my neighbors have known me since I came home from the hospital. I'm walking distance from everything I could want. Although my story is different, my approach is the same as my peers. We're all trying to make the best of our situation and take advantage of opportunities as they happen. The trouble with housing is that, unlike other areas of our lives, we can't manufacture luck through hard work. So many other factors come into play -- credit, interest rates, savings and down payments, location, bidding wars, home costs, maintenance and repairs -- that it's absolutely dizzying. 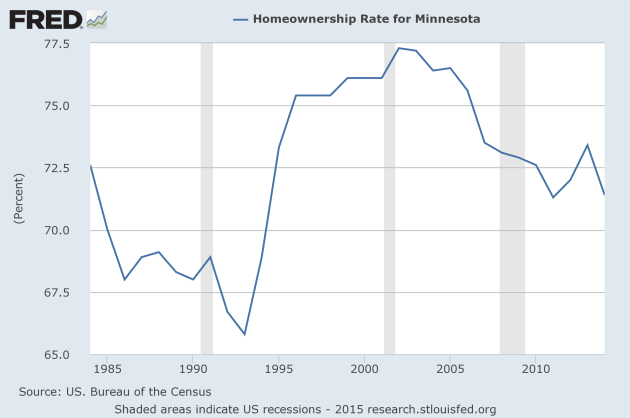 What do you think about the millennial homeownership rates? Tweet us @efficient by clicking the link below.